Lady of Good Council R.C. Church, Christian above 8th Sts. An Italian national parish founded in 1898 and shuttered in 1937, the church known locally as Buon Consiglio played a pivotal role in the community life of South Philadelphia's growing Italian immigrant community during its brief and tumultuous existence. As recounted by Richard Juliani is his book, Priest, Parish, and People, the parishioners' fierce opposition to the sudden closure of their small but beloved church exacerbated the already strained relations between South Philadelphia's Italian Catholics and the Archdiocese for years, and is still remembered generations later as a defining moment in the community's history. By 1897, South Philadelphia's Italian immigrant population was booming—approaching 30,000—and St. Mary Magdalen de Pazzi at 8th and Montrose, the first, and at the time, only, Italian national parish could not handle the overflow. 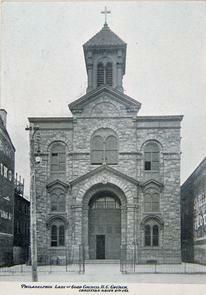 That year Archbishop Ryan announced that the Italians living west of 8th Street would be given their own church. 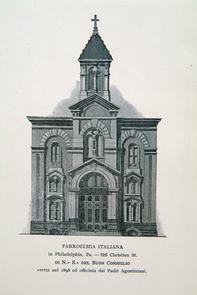 The cornerstone of Buon Consiglio was laid on the site of the old St. Paul's school building at 816 Christian in May of 1899. By 1930, the Italian population of Philadelphia reached 150,000, with the highest concentration in South Philadelphia. The Archdiocese undertook a census of Italian families to survey where they lived and worshipped and determine which parishes best served the community, and which ones could be eliminated. Citing Buon Consiglio's perpetual financial woes, its old, inadequate facilities, incidents of scandalous misconduct of its priests, and a shrinking congregation (one-fifth of what it had been in 1920), Cardinal Dougherty slated Our Lady of Good Counsel for "dismemberment." But Dougherty grossly underestimated Good Counsel's importance to its community of poor and working class Italians and their fierce loyalty and dedication to their little church. On May 3, 1930, three-thousand people assembled in the street in front of the church for an all-night vigil that escalated overnight into a full-scale protest. The parishioners physically prevented the pastor, Father Marini, from leaving the building; when police arrived to free him, the parishioners managed to barricade another priest still inside the church, Fr. Simplicato Gatt, and essentially held him prisoner for months afterward. Although the stand-off eventually ended peacefully and the street protests ended, the battle for Buon Consiglio continued. A committee of parishioners petitioned the Pope in Rome, and initiated legal action to restore their church. Finally, in 1936, the Pennsylvania State Supreme Court ruled against the parishioners; the Archdiocese abolished the parish and closed its doors in 1937. The buildings were demolished a few years later for a parking lot, which remains today. Juliani, Richard N. Priest, Parish, and People: Saving the Faith in Philadelphia's "Little Italy." Notre Dame, IN: University of Notre Dame Press, 2007.